MicroRNAs (miRNAs) are small, endogenous, conserved, non-coding single-stranded RNAs 21 to 25 nt enigmatic molecules, which regulate gene expression at the transcriptional and post-transcriptional levels through sequence complementarity via mRNA cleavage or translational repression in a wide range of organisms. Besides the key regulatory processes such as cellular, biological‚ metabolism, growth, and development, a substantial number of miRNAs play imperative functions in various abiotic stress responses. Plants have highly conserved and more recently evolved species-specific miRNAs to control a vast array of biological processes and abiotic stress responses. Research investigations have established major molecular framework of miRNA biogenesis and modes of action in plants. The crosstalk of miRNAs with different abiotic stresses is discussed comprehensively. 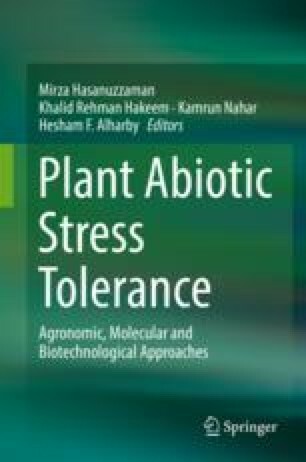 In this chapter, we summarize the current knowledge on miRNA biogenesis, mode of action, and the role of miRNA in abiotic stress response in plants.